It’s strong enough to patch a leaky faucet, can be woven into fabric and stitched into clothing, and will stick to absolutely any surface. Duct tape is not only useful for household repairs, but it can also be a crafter’s most versatile medium. Available in tons of colors and patterns, there’s a style out there to suit any artist’s palette. Also, because it's self-adhesive, duct tape projects are often no-sew and great for kids. 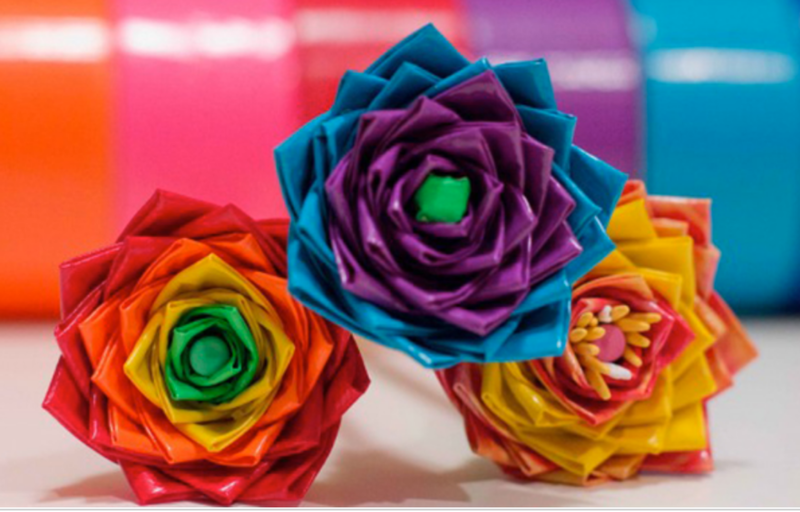 Check out these handy how-tos to get started crafting with this flexible material. 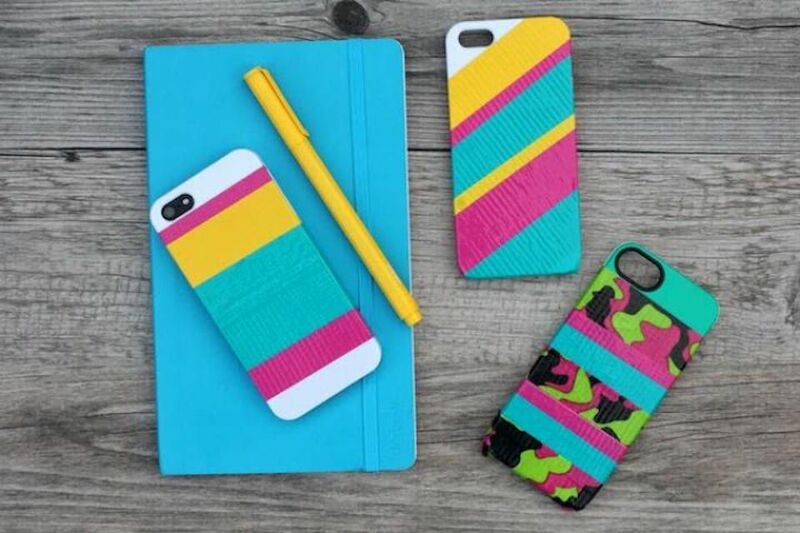 Design your own patterned phone case using strips of colorful duct tape. Arrange tape into trendy herringbone, experiment with funky stripes, or go with preppy plaid–the design is up to you. Pro tip: use a craft knife to carefully snip tape around your phone's camera lens. Elevate school supplies by adding shiny flowers to the tops of pens and pencils. Using just a couple of clever folds, this pattern builds into a lovely bloom, and can be easily tweaked for different flower shapes and colors. This one's a great (and easy) project to help combat those back-to-school blues. Craft an envelope-style pocket by sticking tape to itself in coordinating colors to create your material. Fold into a pocket shape (or clutch, or pouch), then add self-stick velcro rounds as closures. These are perfect as reusable gift wrap, to keep coupons organized, or as cute coin purses. For the most polished look, finish your pocket with a contrasting border. Personalize–and simultaneously reinforce–your notebooks and journals with duct tape. Cut geometric shapes to scatter over a plain binder, or totally redesign your composition or sketch books by covering them completely from front to back. Grab a length of cord and wrap it entirely in metallic duct tape to create a versatile base for a fun piece of jewelry. Even little ones can jump in at this point and add more tape (or beads, charms, or paint) to bling-out these shiny bracelets. Thanks to duct tape's relentless stickiness, no clasps or ties are needed! Make your drink more portable with a handy duct taped sling. Simply wrap a standard bottle, sticky side out, then re-wrap, sticky side in, to create a carrier. This thorough tutorial also includes tips for adding a strap to your beverage holder. For duct tape beginners, start with an old beer koozie and wrap it in tape–it makes this simple project even easier and adds an insulated layer to keep your water cold. Add a bit of flair to your key ring with these sharp DIYed key chains. Opt for delicate, metallic, patterned duct tape for a chic product, or select vibrant shades to bring a pop of color to your day-to-day. Either way, finishing these accessories with a cluster of rhinestones or gems is a great idea. Protect your sunnies in style this summer with this tutorial for a cute case. Inexpensive felt lining keeps glasses scratch-free, and adds a bit of heft to your homemade case. This project comes together in mere minutes, and is so simple, you'll be able to make a case to match all your pairs of shades and every single one of your bags. Feng Shui your junk drawer with some repurposed cardboard boxes and your favorite patterned duct tape. Not only will odds and ends stay organized, but you'll be delighted by whimsy every time you open your desk drawer. With the help of a trash bag liner, these clever bags are both water and sand proof, and therefore the perfect tote to bring along to the beach. This helpful tutorial includes a step-by-step for decorative flowers, too! Come the holiday season, you'll need this fun and festive bow garland in your life! Fashioned from duct tape, these mini bows will look adorable on your tree, mantel, or railing in an array of colors.